Tune In / NCYC '07: Forgive us now (Brown). “As we forgive may we be healed, as we reach out….” An excellent ballad seeking forgiveness in a sinful world. Lyrics and sound sample. 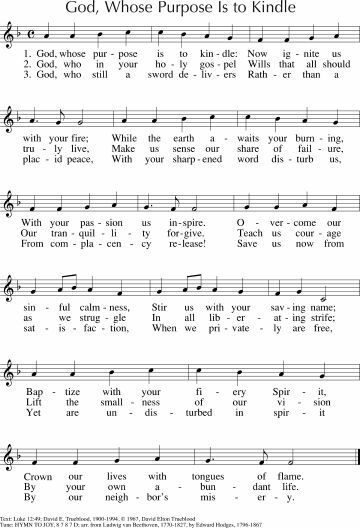 Recorded Music If you had a vineyard (Sinéad O'Connor) Ray Gormann played this to our congregation three years ago; taken directly from this passage, this protest song is very moving. It's from the album "Theology". Video. Some words from Sinéad about her interpretation of this passage. SFFS 2169 God How Can We Forgive (Duck) Good words of healing in the midst of broken relationships to the familiar tune LEONI. Lyrics (scroll down). HPSS437 / CP591 / W&R586 Our Cities Cry to You O God (Clarkson) Good words of helping to heal injustice in the world. Being the body of Christ. Sung to a very amiliar hymn tune. Lyrics and tune sample. Iona (Sent By the Lord) / MV066 Senzenina? / What have we done? (South African) This beautiful chant from South Africa asks the question that we often ask when things go wrong beyond belief. It's important to know what the song means when singing it. If you have some part-singers in your congregation, this would be particularly good. It's good to let people ask this question. It is also on the soundtrack for "The Power of One" so you could also play the recorded music if appropriate. Free sheet music (loads a pdf). 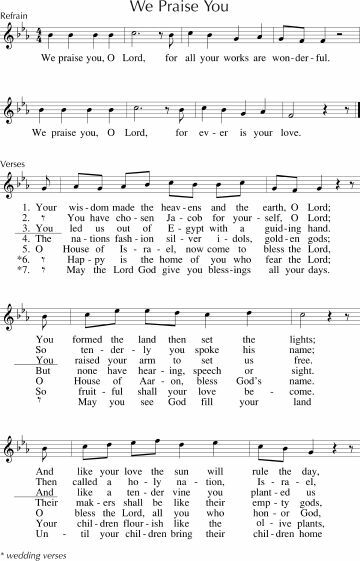 Emergent Psalter Restore us God (Everett) Another good refrain and read Psalm with instrumental backing. I'm loving this book. 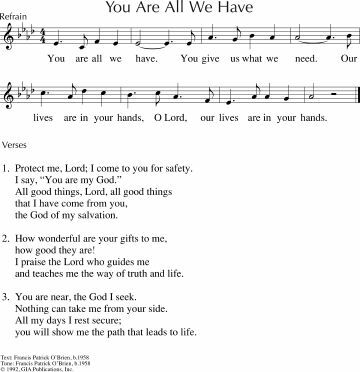 StJ / G(II)346 / GC506 / GC(II)508 You Are All We Have (O'Brien) A nice refrain and good cantor parts. Somewhat formal. Sound sample, sheet music sample and a different sound sample. TiS 42 / GA47 Lord make us turn to you (Boschetti). A simple refrain and mostly inclusive cantor part. We have sung this at Brunswick and it went very well. Don't forget that you can use these refrains with a reader if you don't have someone confident enough to cantor. W&R632 / Cha512 When Aimless Violence Takes Those We Love (Patterson) Excellent words for a time of grieving violent death. It's sung to the well known tune SURSUM CORDA. 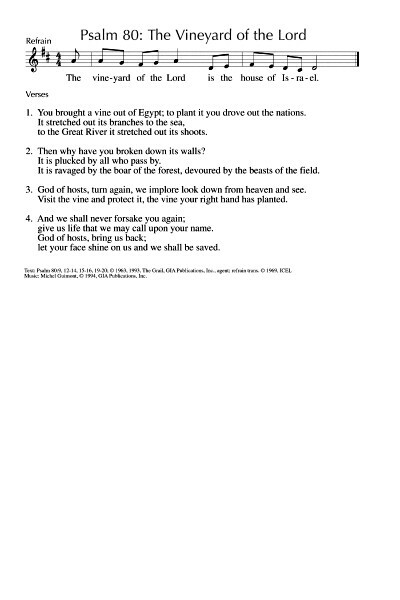 NCH497 / SFFS 2208 / HPPS354 / G(II)508 / GC707 / GC(II)684 Guide my feet while I run this race An excellent civil rights song. Would work well as a meditative prayer for guidance or as an uplifting call to action at the end of the service. Lyrics and clunky sound sample. 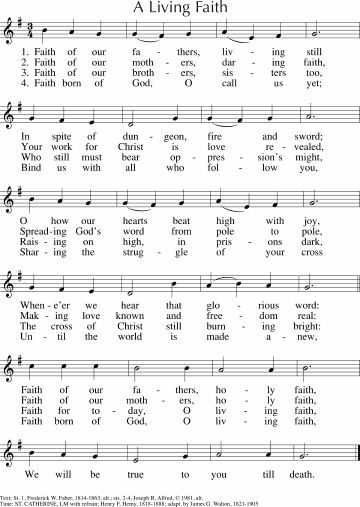 UMH710 / VU580 / LBW500 / ELW812 / ELW813 / HPP505 / GC600 / GC(II)579 / RS 726 Faith of Our Fathers living still / A Living Faith Simple known tune. Words include fathers, mothers, sisters and brothers. Sound sample, lyrics and sheet music sample. SFFS 2129 / HPP322 / W&R344 / Cha344 / Srce2-244 I Have Decided to Follow Jesus (Traditional) Good simple traditional chorus. This Australian video (maybe it's Hillsong, sounds like it) uses some nice chords. AoVK-28 / ATOK 376 Faith hope and love (Watts) If you didn't sing it last week you can sing it this week! This is so easy, and so cool. If you have some groovy musicians, this can even be a very funky rock song. Very easy, and great for kids and non-readers. Sound sample (scroll to F and click - it's a bit silly). TiS 643 / UMH206 / StJ / WoV649 / ELW815 / G(II)352 / GC508 / GC(II)513 / W&R248 I want to walk as a child of the light (Thomerson) An old-style favourite. Lyrics here. Sound sample. CH159 / CP(E) 81 / W&R70 / Srce439 Lord for the years your love has kept and guided (Dudley-Smith) Very traditional. Good words. Some strangely non-inclusive language (but maybe it IS just men who've disowned God?). Sung to a well-known hymn tune (O PERFECT LOVE). Lyrics and sound sample. CH683 / VU420 / GC(II)469 / CP598 / W&R553 / URW132 Go to the world Go into all the earth (Dunstan) Great words of sending out. Can be sung to a couple of different tunes. SINE NOMINE is the easiest and best known. Sound sample. Sheet music sample. TiS 749 / AoV1-154 / AoVK-131 / ATE 305 / NCH360 / Iona (SBL, Freedom is coming) / CH800 / UMH497 / VU572 / WoV773 / ELW809 / HPP340 / G(II)484 / GC677 / GC(II)674 Send me Jesus / Thuma mina Lyrics and weird sound sample. TiS 470 / CH742 / UMH708 / LBW26 / ELW264 / CP(E) 227 / W&R531 / Cha476 Rejoice in God’s saints today and all days! (Pratt Green) Great words about all the different saints and the importance of remembering them. The 2nd verse which mentions "some carry the gospel through fire and through flood" may be particularly appealing. Works well to the tune PADERBORN, but would be even simpler sung to LAUDATE DOMINUM which would be more familiar. Lyrics and some tune samples, or LAUDATE DOMINUM tune sample. TiS 387 / CH416 / UMH318 / VU158 / LBW363 / ELW389 / RS601 / CP(E) 140 / W&R312 Christ is alive Let Christians sing (Wren) Excellent words of Christ's saving, and still relevant grace. A couple of tunes are offered in different hymn books. I prefer TRURO. Lyrics and sound sample. AoV1-021 / ATOK 402 / StS114 / G(II)488 / GC682 / GC(II)669 God Has Chosen Me (Farrell) I love this one. Energetic, and great words of justice. Sheet music and sound sample. GC714 / GC(II)704 God Whose Purpose Is to Kindle (Trueblood) These words are based on this passage, but something about it is a bit clunky. It's sung to ODE TO JOY so is simple to sing. Lyrics and sheet music sample. The Trublood goes well with hymn tune Stuttgart as well. Ha ha, Ann! You are biased, but it's also a good idea. I've added it in for both readings.